As an alternative to typing and assigning images to words, you can now use the new insert word button on the narrative editor to insert a word image. 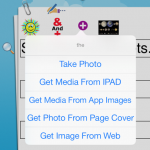 This feature is useful if you wish to have an album of images for a particular category such as “Planets”. Then you can engage with the child to insert the planet “Mars” for example. Have a go setting this album up. 1. 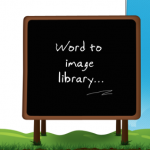 Go to the home screen and click “Word to image library…” bottom right. 4. Click on the “Planets” folder that has been created. 6. When the menu appears select “Get Image From Web”. Make sure you’re connected to wifi or a 3G. 1. Now go back into the book edit screen and click the row to edit the text. 2. 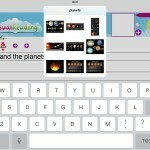 Press the new insert word button and navigate to the “Planets” folder and find the newly created “Mars” word. 3. Once clicked on, it should insert that word into the book. Have fun and try to engage with the child to insert their own images using this feature.